We’ve quickly left the first month of a ‘new year’ and jumped right into February. While it may not sound too impressive (moving on to February that is), I’m extremely proud of myself on accomplishing the fact while balancing studies, blogging and artwork all at once! That aside, this month’s OWLS theme was particularly awesome. (They all are, but this one was beautiful). Lyn-san really gives great topics! For those of you who don’t know who OWLS are, we are a group of anibloggers who strive to promote self respect and acceptance. To know more about OWLS, visit the official site. Yesterday, Carla-san from Pop Culture Literary gave their take on “Competition” , so go there first and check it out! 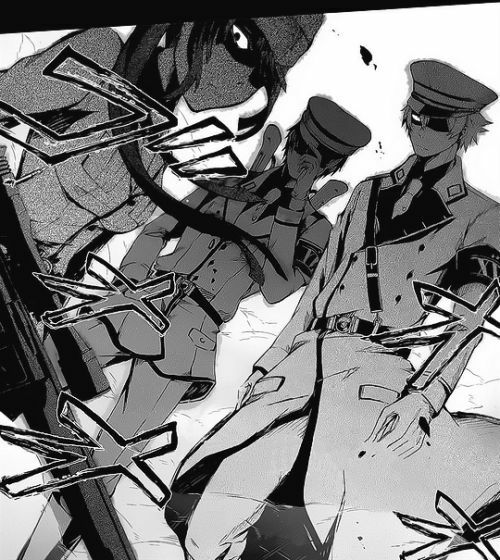 Aoharu Kikanjuu is essentially a shonen manga/ anime about survival games. Survival games are basically real life video game versions where people can form teams and compete with each other in artificial settings (forests, castles, etc.) with guns that shoot plastic pellets instead of bullets. The story follows a high school girl Tachibana Hotaru and the team she’s in- Toy Gun Gun. The other two members are Tooru Yukimura and Masamune Matsuoka, who both do not know that Tachibana is a girl (Typical cross dressing manga). There is a third member named Haruki Hosokawa, whose twin is in the rival team of Hoshishiro. Hoshishiro is the other team that the manga focuses on. The leader of Hoshishiro is Midori-sama, who was the reason Matsuoka-san began to play survival games. But due to some falling out where Midori-sama basically discards Matsuoka-san, he forms Toy Gun Gun to exact revenge on Midori-sama and make him take Matsuoka-san back into his team again. Midori-sama, is, in case any of you want to know, my pick for favourite character of the series. 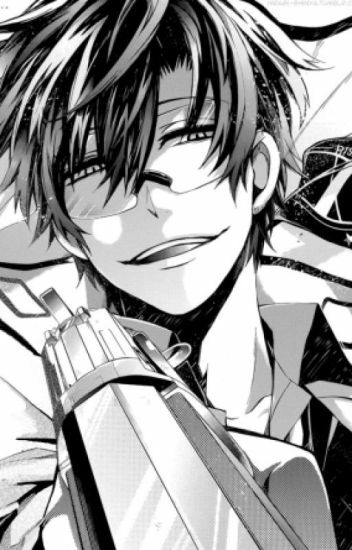 He’s sadistic, caring and attractive all at once. I know right?! Like I was saying, Midori-sama and Matsuoka-san were one of the strongest teams, but when their captain told Midori-sama that his being with Matsuoka-san was the worst Matsuoka-san could hope for, he decides to cut him off. Midori-sama chooses to cut it off with Matsuoka-san, and instead to provide him with something that’s sometimes better than a team mate. The strongest opponent. While it could be argued that there were less harsher methods to deal with it, I personally relate to Midori-sama’s choice. You try harder when you’re angry and denied. Especially when you’re someone like Matsuoka-san who has lost everything dear to him already. The best type of competition is one that draws the best from you. And Hoshishiro is the perfect competition Toy Gun Gun could ever hope for. Not only Matsuoka-san but even Tachibana-tan and Tooru-kun grow by leaps and bounds. They would have grown either way, but like I mentioned before, the fun and excitement of competing requires a strong opponent. Without Hoshishiro, the bond between TGG wouldn’t have been this strong. Without Hoshishiro, there would have never been TGG. I’ve mentioned this time and again, but I love twins in stories. They fascinate me. 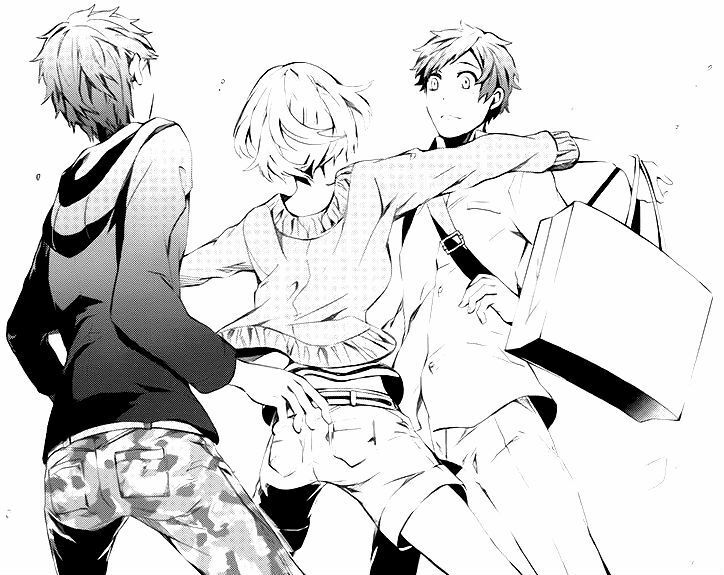 Aoharu x Kikanjuu like so many stories these days deals with a strained relation between twins. Haruka-kun and Haruki-kun are on opposing teams. Teams that are, if we may, fated rivals. Haruki-kun or Haruharu as he’s called is pushed to his edge by his father who eternally compares him to Haruka-kun, the ‘perfect son’. HaruHaru begins to draw himself inside more and more. The twins are a classic example of ‘unhealthy competition’. At a time when the relation is already strained by a competition gone bad, any effort to fix it just causes more unintentional damage. Haruka-kun, for instance, in an effort to prove to Haruharu that he’s not ‘useless’ like his father says, begins to call him ‘onii-san’. Haruharu, on the other hand, can only think of this as the final insult to mock him and they drift further apart. But Haruka-kun himself goes to Hoshishiro in hope that Haruharu will win against them and finally realise how much Haruka-kun loves him. 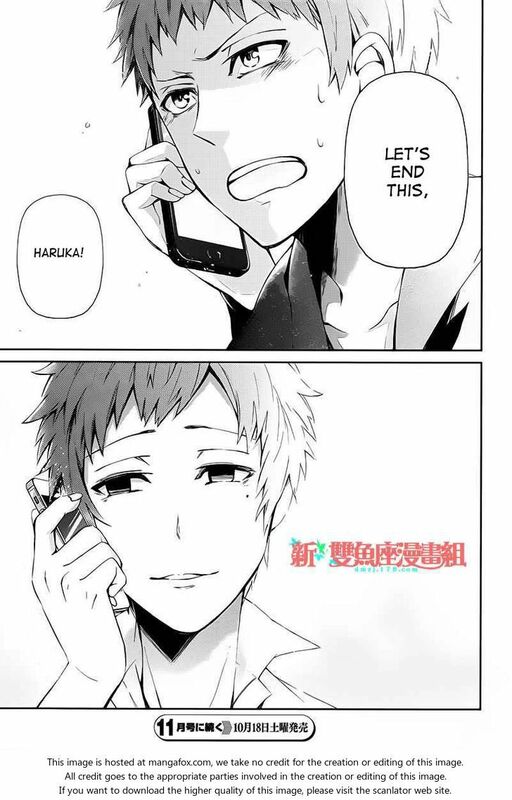 And while Haruka-san somehow converts the competition between his brother and himself into a worthwhile one, Aoharu x Kikanjuu really depicts how a forced competition works antagonistically to a healthy one. Competition Doesn’t Always Imply Healthy Competition. But Sometimes There’s NO Competition. I think that Aouharu x Kikanjuu is the perfect manga that represents the different effect competition could cause on different people and in different methods. I really loved the manga and like any other sports manga I found myself being captivated by the fierce joy of teams, passion and above all competition. But also, like any other sport manga, it drew out another emotion from me. It is one of my most wished for thing. A sports team with which I could compete. And lose or win, tears or laughter, it would have been together. Every competition I’ve attended, we lost. Be it in straight sets or whether we hung on till the very end, we had lost. At the beginning, I didn’t mind, it didn’t matter, I could still play, that’s what was important. Right? But after a while, I wanted nothing than to play well. Don’t get me wrong, I did want to win, but more importantly, I wanted to at least lose with my all. Most of the teams I were in either gave up when the score tipped away from our favour slightly or never bothered practicing in the first place. It wasn’t ever a match. It was never a game. I can’t hope for a Midori-sama in my life or even a Tachibana-tan, but I want someone to chase after or even better, run along with. There’s nothing worse than hearing your voice screaming, “Let’s get them.” or “It’s fine, only a couple of points away!” with no reply, with no response but blank faces. There’s nothing worse than wanting to cry after losing but knowing that I hadn’t worked hard enough with my teammates to afford that luxury of tears. Nothing worse than not having a team to play against. To toss the ball to the wall and run laps by yourself. There’s nothing worse than having no competition. Than knowing that your last chance of a decent fight had just slipped away. That you yourself weren’t good enough competition to encourage your teammates, or be competition for yourself. Because the best competition for anyone is who they were yesterday. As always, thanks for reading. While the conclusion for this particular post isn’t quite, well, a conclusion, I’d still love to hear your thoughts on competition. Do you find it as necessary as I do? The next OWLS blog post is by the wonderful Poke-san, who’ll be talking about Ashita no Joe and Competition in the same! Not the day I didn’t like it (I did, very much), but it was unexpected! Great post as always, and hoping to see more soon! Ahhh, see? THIS was what I was talking about. I was this close to omitting that part in the final draft…. Yes..a new month and and a new topic: I always love reading the Owl’s posts. Honestly to answer your question: I have never really felt the need for competition. But that’s probably also because I don’t really like sports. I do like boardgames. But even there I don’t really feel the need to win. I’d rather have a good time. That said: this is a fun topic, as next week there is going to be a competition to celebrate me having reached 1000 followers with some cool prizes that can be won as well 😊😊 Great post Auri! Ah, I see Rai-san! Well, I suppose having a good time is ultimately the goal…. Whoo, yes! This time I will NOT miss the post. I think we need challenges, for some those mean competition against others and for others that means over coming personal goals. It depends on how our mindset works and weather out not we need someone else to challenge us. Regardless of whether it is the need of a different person or a different you, challenges and competition refine us. Such true words! I actually think that competition is healthy only when it’s with our past self. I have never actually thought of anyone as my rival, because at the end of the day, no matter how much of a sportsman spirit I posses, I know I will have a small emotion of pride or grudge whenever I win or lose against my rival. At least when my rival is me, I couldn’t help but make myself better with time. Isn’t this the same manga that you told me to read when we were selecting a manga to review? I guess it’s about time I read this one. I loved how you analysed it and the art style looks really cool too! Others as competition will only take you so far, you know? But at the same time, for me really, in a team sport you need a team. I want a team goddamn it! XD, honestly though, I just want to play. YES! READ IT READ IT READ IT! Great post. I liked this anime a lot. It’s kind of underrated. I’m glad you used this for your owl post. It goes perfectly with the theme. Thank you so much Steph-san! This series matched the theme perfectly.